Our family is on a quest to visit each of the 50 states before Trevor is 18. Whenever possible, we include a visit to the state's capital city and the Capitol building in that city. When I posted 13 Helpful Tips for Visiting a State Capitol with Kids, our family had been to 20 of the 50 Capitol buildings. If all went as planned, we visited our 21st earlier this week! Some of the Capitols have word searches, crossword puzzles, and other kid-friendly activities for families to print and bring with them when they visit the Capitol, but many do not. I challenged myself to create a printable that would work regardless of which state capital you visit. It was tough, but I came up with this bingo card. Of course, it could be done competitively, but I envision using it cooperatively as a family, with a prize (something small from the gift shop?) for the kids getting either bingo or blackout. 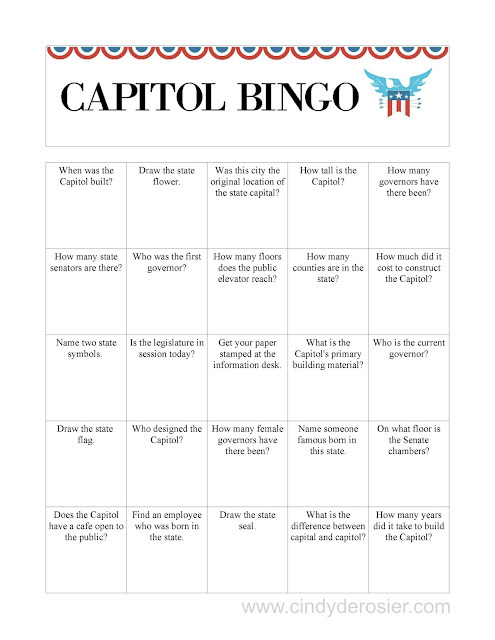 Next week I'll be sharing all about our recent travels to the capital of the Lone Star State, including how we did completing this bingo card in Austin! How fun to visit TX!!!!!! !